PID allows for precise temperature control. Yes, will accommodate cups ranging in size from 2.5 to 5” in height. Double, both are aluminum, and lined with stainless steel. Single aluminum boiler, lined with stainless steel. Inexpensive double boiler system, fast, convenient, and easy to use and master. Under-sized bean hopper, grinder should be upgraded to ceramic, no temperature control. Grinder should be upgraded to ceramic.Also makes a bit of a mess when dispensing grounds into the portafilter, increasing routine maintenance. Newbies will be intimidated, even though this is a fairly forgiving machine and easy to use. Our overall winner. These two machines are very close in terms of capabilities, but for us, the double boiler and super-auto convenience features push this one ahead by a nose. One of the best semi-autos on the market, and a tremendous value for the money. Depending on exactly what you’re looking for in a machine, this could easily be your top pick. 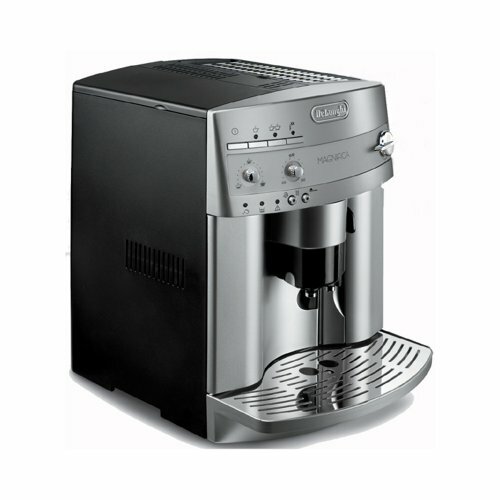 This older model by DeLonghi is still going strong – an exceptional, starter machine that’s full-featured and very newbie friendly. Recommended for: Anyone. It’s got enough fine-grained controls to satisfy most coffee purists, while being easy for newbies to master, and it’s small enough that even people with limited counter space can find a permanent home for it. 4 Who Wins on Points? Despite the fact that these are two totally different classes of machine (a semi-auto versus a super auto), as you can see, they have quite a bit in common. This is because Breville’s offering includes a number of convenience features that you don’t normally find on a semi-automatic machine, which is insanely cool, and really makes it more of a hybrid or crossover model. In the sections that follow, we’ll take a closer look at each of the major factors that drive both models and see how they compare. Size-wise, the two machines have a similar footprint and should present no particular challenge in terms of finding permanent homes for them. Despite the fact that the 3300 is made out of ABS plastic, it’s slightly heavier, owing to the second boiler. Although Breville’s model is dressed in thin stainless steel, rather than the thicker plating you find on more expensive machines, it’s still more rugged and durable than the Magnifica, so if that’s important to you, then the 870XL is the one you want. Our Recommendation: We’ll be saying this a lot over the course of this review, but it does depend on what kind of machine you’re looking for and what you want it to do. Regarding durability, we give the nod to the 870XL. Both are well-made machines though, and with proper care, both will provide you years of reliable service. As power drinkers, we always gravitate toward machines with larger water tanks, and in our view, there’s no such thing as a reservoir that’s too big. Both machines are close in this regard, but again, Breville’s model edges out the Magnifica, offering a slightly bigger tank. Even so, it’s close, and both models will be able to keep pace with a single power drinker, or larger households with several casual drinkers. In our view, this is one of the most critical components of our Breville BES870xl vs DeLonghi ESAM3300 comparison review, and we’re giving this dimension to the Magnifica, on account of its dedicated milk boiler. If you make several milk-based drinks over the course of a day, then you’ll appreciate the speed and convenience the second boiler provides.That said, the 870XL is not without its advantages, the biggest one being precise temperature control, thanks to the PID. It’s a little cumbersome to use, but once you master it, you can really fine-tune the temperature of the drinks you create, which is something that the Magnifica just doesn’t allow you to do. Our Recommendation: If precise temperature control is critical to you, then you’ll disagree with our assessment here and gravitate toward the 870XL. We find the 3300’s default setting to be more than adequate, but we also understand that not everyone will agree. 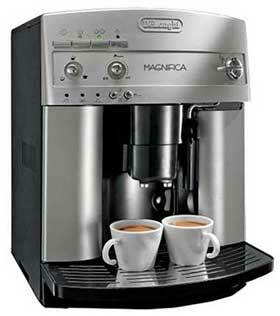 The Magnifica also wins on this front, because it’s simply easier to use. As semi-automatic machines go, the 870XL is quite forgiving and newbie friendly, but many people who are new to the world of specialty coffee drinks don’t want to practice their Barista skills in any significant way. Because of that, they tend to shop for convenience and ease of use, and on that front, the ESAM3300 delivers. Our Recommendation: Again, it depends on what you’re looking for in a machine. If you want to hone your Barista skills, the 870XL is the clear winner, but if you’re looking for something simple, quick, and easy to use, then Delonghi’s offering is a no-brainer choice. Both models use a conventional steam wand, but in our view, Breville’s offering has the superior wand. It’s longer and more fully articulated. True, you’ll see some wait time as the single boiler task-switches, but once that’s out of the way, the 870XL’s wand delivers superior milk foam. Our Recommendation: If you’re interested in burnishing your Barista skills, this feature implementation only serves to underscore the fact that the 870XL is the model you’re looking for. The 3300’s wand isn’t bad by any means; it’s just that Breville did this feature better. 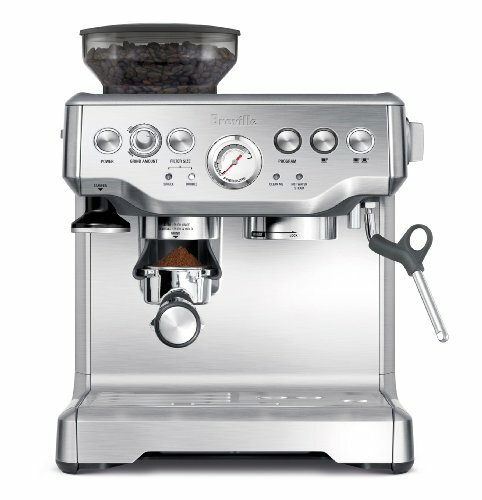 The Magnifica wins this one by default since it’s a feature Breville’s 870XL doesn’t have. Crema is an important dimension where crafting a great specialty coffee drink, and you’ll get more of it, and better-quality crema from the 3300, with proper placement of the coffee spouts. This is essentially a push when comparing the two models. Both of them have a passively heated cup warming tray, though in practice, thanks to the precise temperature control offered by the 870XL, it’s something you may not find that you need in every case with that model. One of the key selling points of super automatic machines is that they tend to be easier to use and clean, so it should come as no surprise that the ESAM 3300 wins the day here. What is a little surprising though, is the fact that the 870XL keeps pace fairly well. True, it’s slightly harder to clean, and moderately more difficult to learn to use well, but even so, the differences aren’t as stark as one might expect, and Breville deserves praise for a job well done on this front. We regard both of these machines as exceptional, so in this section, we’ll focus only on the things we feel they got wrong or implemented poorly. Where the ESAM3300 is concerned, the biggest thing for us is that we’d love to see the grinder upgraded to ceramic, and for the size of the bean hopper to be expanded by about two ounces. We’d also love to see some sort of boiler temperature control. The 870XL has a few problems of its own. The system is fairly easy to use, but still a bit cumbersome, especially when you’re first starting out with the machine. It’s easy enough to master, but we do feel that there’s room for improvement here. The grinder also tends to scatter grounds all over the drip tray when dispensing into the portafilter, which is annoying, wastes beans, and requires more cleanup after each drink you make. On the whole, though, we regard all of these are relatively minor issues and don’t see any of them as deal-breakers. 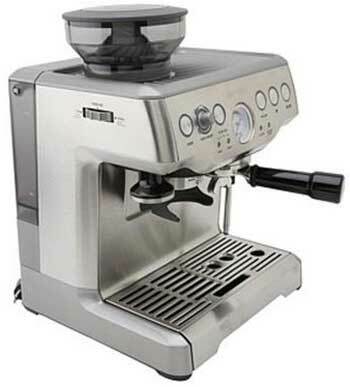 This older model by DeLonghi is still going strong – an exceptional, full-featured starter machine that’s full-featured and very newbie friendly. A unique machine in the world of semi-automatics, and amazingly full-featured for an entry level model. Anyone. 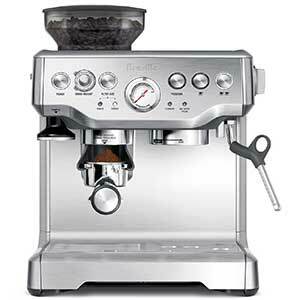 It’s got enough fine-grained controls to satisfy most coffee purists, while being easy for newbies to master, and it’s small enough that even people with limited counter space can find a permanent home for it. 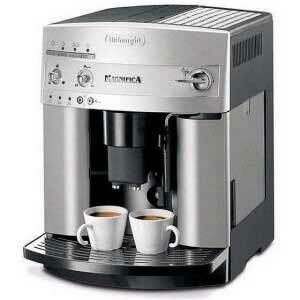 This is an especially newbie-friendly machine and a great model to learn Barista skills on. Great for power drinkers and can keep pace with larger households. Having said that, both models also offer enough fine-tuning to appeal to coffee purists, although most purists will likely gravitate toward the 870XL because it offers virtually unlimited grind settings and more precise control over the drink making process. And that wraps up our DeLonghi ESAM3300 vs Breville BES870XL side-by-side comparison review. These two machines come from different worlds but are surprisingly close in terms of capabilities. For us, it was an agonizing choice, because we love the control the 870XL offers, but in the end, the speed, convenience, and ease of use prompted us to award the win to the DeLonghi Magnifica ESAM3300. That said, if you’re looking for a low-cost machine that will give you tons of control and allow you to practice your Barista skills at home, you’ll probably find yourself disagreeing with our assessment. That’s fine too! The bottom line is, you won’t go wrong with either of these machines, provided you have a clear image in your mind about what you’re looking for and precisely what you want your new machine to do. 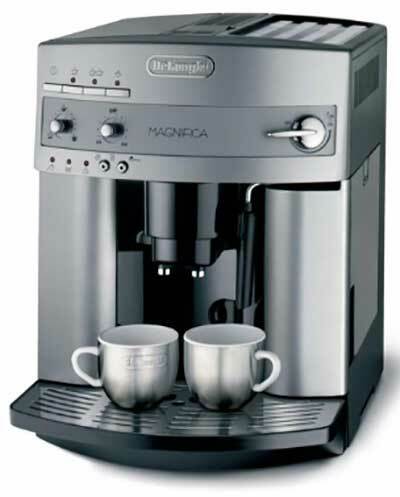 DeLonghi Magnifica ESAM3300 User Manual. DeLonghi USA. Official Brand Website. Breville USA. Official Brand Website. How to Make a Bottomless Portafilter. Coffee Kind. 10 of the Best Rated Coffee Beans (To Try Before You Die). Home Grounds.